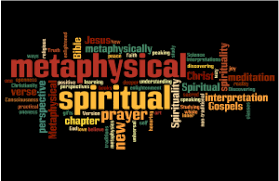 Though this list of Metaphysics_Definition_Dictionary_N-R may not be 100% complete, It will give you the terms you will need to understand metaphysics and all it's teachings. I give thanks to Ernest Holmes Founder of Science of Mind, one of my mentors for this information. NEUTRAL: Not caring which way it works. NATURAL MAN:Instinctive or Spiritual Man. NEUTRALIZING THOUGHT: The act of mentally erasing thought images. OBJECTIVE MIND: The conscious mind. OBJECTIVE PLANE: The outer world of expression. OBJECTIVE SIDE OF THOUGHT: The conscious side of thinking. OBJECTIFICATION: The act of objectifying. OBSESSION: Being controlled by thoughts, ideas, or entities. OMNISCIENT, INSTINCTIVE I AM: God in man and things. PRACTITIONER: One who practices mental healing or demonstration. PERSONALITY: The objective evidence of individuality. The man as we see him in the relative world. PSYCHOMETRY: Reading from the soul side of things. PRINCIPLE: Any law of nature. PERCEPT: An external object perceived by the mind. Distinguished from a concept which is an inner idea. PLANES: Different rates of vibration. PRIMORDIAL SUBSTANCE: The ultimate formless stuff from which all things come. PEACE: A state of inner calm. POWER: The union of peace with poise. PERFECTION: The real state of being. PSYCHOLOGY: Study of the workings of the human mind. PARTICULARIZATION: Concrete forms produced by Spirit. PRENATAL: Conditions before human birth. PSYCHO-ANALYSIS: A systematic analysis of the subjective thought. PHILOSOPHY: A man's idea of life. PSYCHIC WORLD: The world of subjectivity. PSYCHIC PHENOMENA: Phenomena of the soul or subjective mentality. PASSIVE RECEPTIVITY: Willing to receive any and all forms of thought. REVELATION: Becoming consciously aware of hidden things. REASON: The mental ability to analyze, dissect and figure out the cause of things. The human mind can reason both inductively and deductively. The Divine Mind can reason only deductively. REALIZATION: Subjective comprehension of Truth. RELATIVE: That which depends upon something else. REINCARNATION: Rebirth in the flesh. RESURRECTION: Rising from a belief in death. REALITY: The truth about anything. RELIGION: A Man's idea of God or gods. RACE-SUGGESTION: Human beliefs, operating through the mentality of the individual.